Me, standing midway between 2 patios. 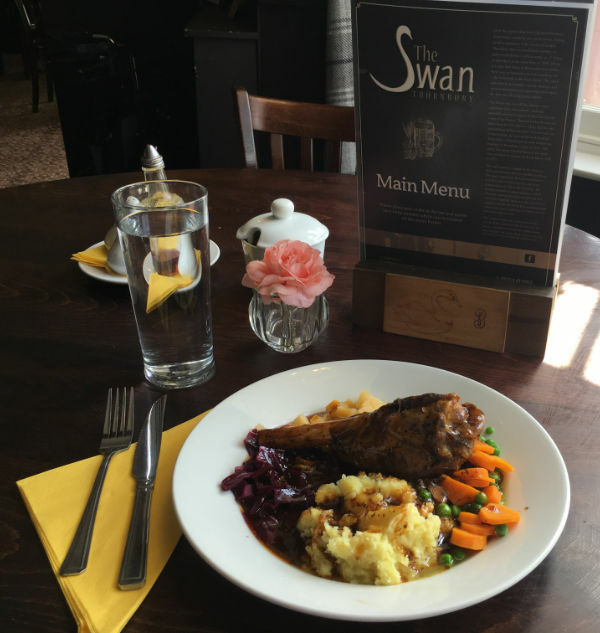 Meals at pubs are a part of experiencing England. 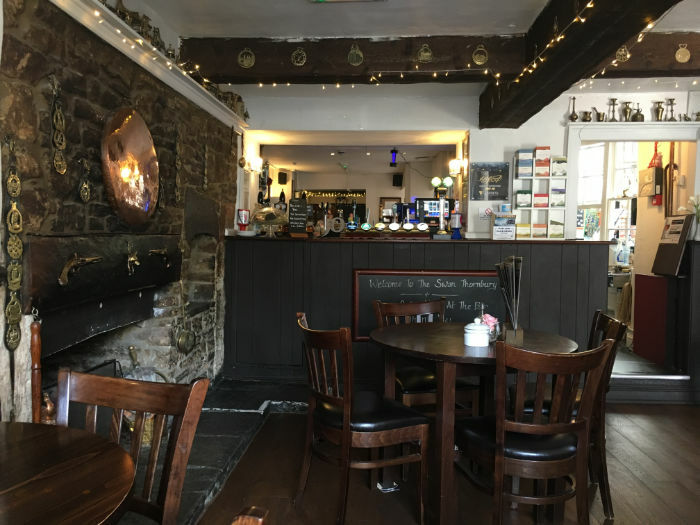 When you find you’re hungry and there’s a pub around, you’re usually in for a treat, even if you don’t adore the food. My first pub food this trip is in a small town you’re likely not to get to but I’m sharing it with you anyway because it’s worth seeing the menu. 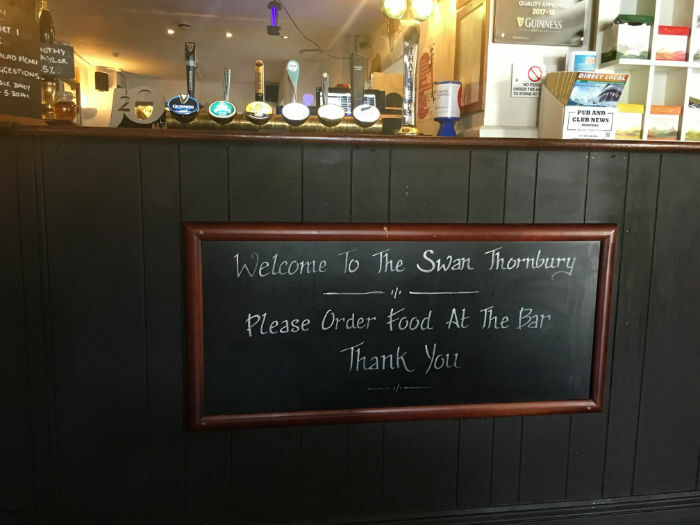 And of course, if you get to Thornbury, I recommend The Swan. 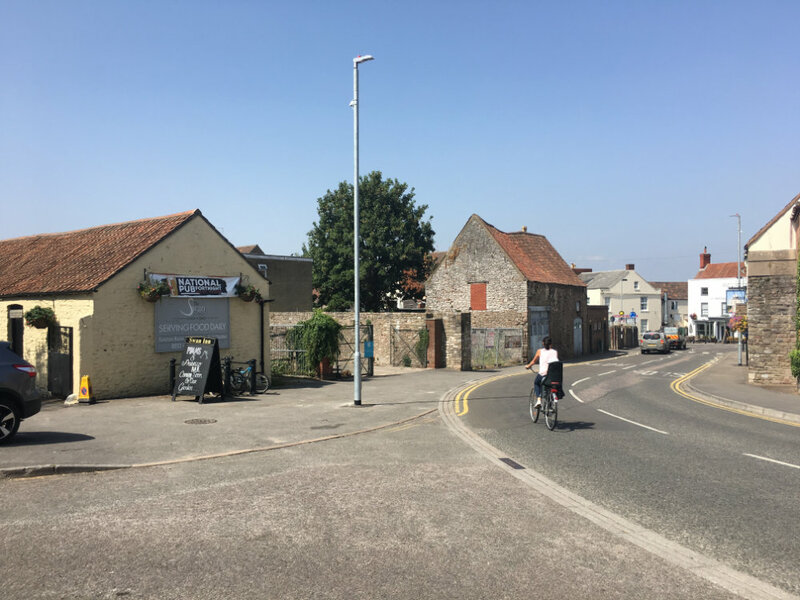 On my first solo visit to the town of Thornbury, a suburb of Bristol in the south of England, I slowly walked one mile to the High Street, enjoying the walk. This seeming small pub caught my eye. 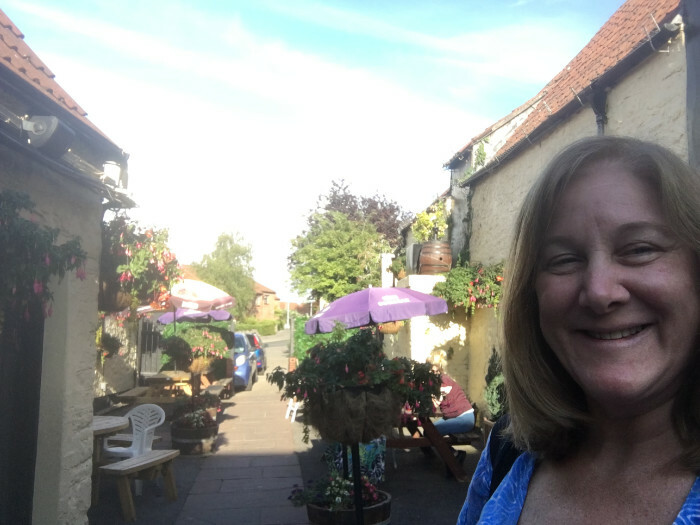 Of course, my time in Thornbury will include many a slow pub meal, so one thing I did on this day was to stop and see any pubs I passed. Outside of town, closer to “home,” I’d passed a modern pub where I intend to come for ribs. 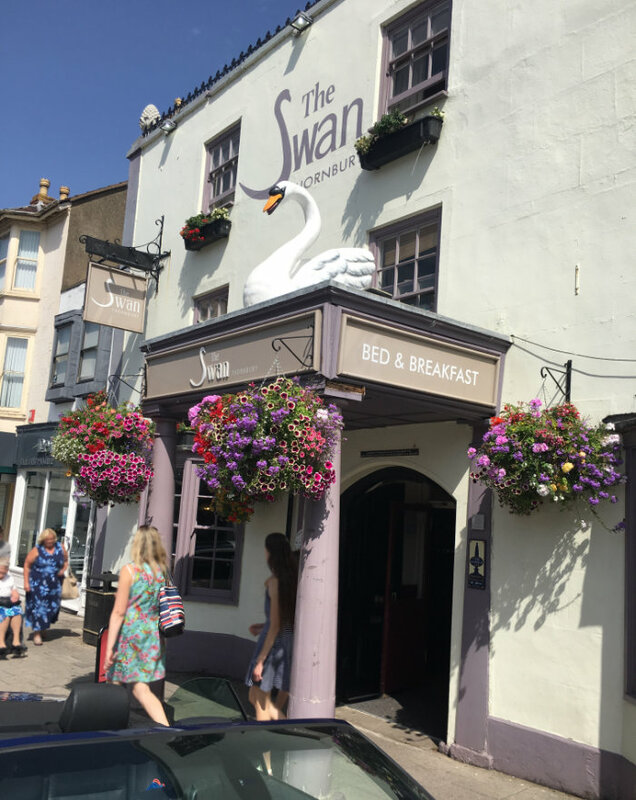 In town, just past the ALDI supermarket, as I walked toward the High Street, I passed what looked to be a tiny old pub, The Swan. I had an errand to run (we still need dentists and doctors as we travel) so I continued on after taking this photo of it. After the dentist’s office, I walked back up toward the top, main part of the High Street. However, before seeing the High Street, I was interested in checking out that small pub I’d passed before. 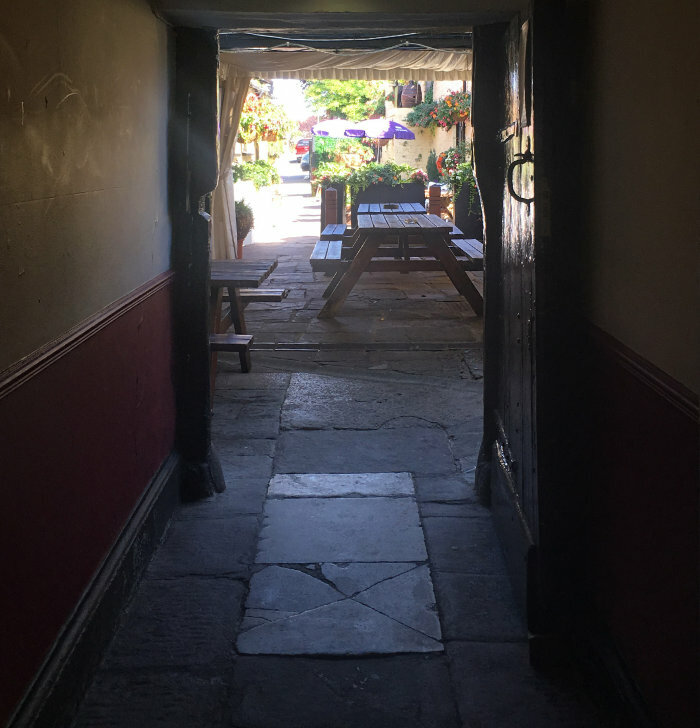 So I went back to it and turned right, into its alley, seeking the pub. It turned out that the building I’d thought to be the pub may have been a part of the business but it wasn’t the pub and this pub wasn’t so tiny. The alley led to a larger building. I’d come through the back. I was there at an off hour. I think a bingo game had ended. Several retired folks were sitting around enjoying the company of friends. Coming upon the bar and dining areas, I liked the menu and stopped to order a meal with the helpful, friendly, young bartender. After ordering and taking a seat, I walked out the main entrance to have a look. This is the High Street entrance. Immediately inside the main entrance, you’ll find a bartender — perhaps helping or chatting with other customers, but ready to come over and greet you and help with your questions or order. 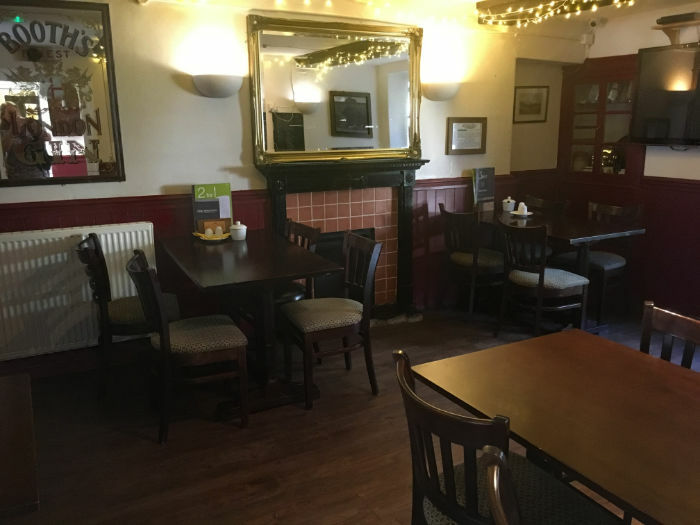 At the recommendation of the barwoman, I took a seat at the empty round table in the bay window of the pub so I could watch life go by on the High Street. I was happy that while other tables were taken, that one was free. My view of the other dining room. The room I dined in. I tasted the gravy, then a few of the vegetables and finally the meat. I used my knife for my first cut of meat of lamb shank and it cut easily. It tasted so nice. After I cut and savored a few small pieces, the meat simply fell the bone. The plate was quite full and I liked that it contained a surprising amount of vegetables. Peas, carrots, spinach with a clear taste of nice butter, yellow mashed potatoes, turnips and some pickled cabbage. The mint sauce was brown and rich but not too rich — and it wasn’t even a bit salty. It was great. Next time, I’ll ask for extra!! The meal was quite filling and took me quite a while to eat. It really would have been enough. However, perusing the various menus as I slowly ate my Lamb Shank, I discovered that a desert is just £1 with a full meal on Mondays. How could I resist that when I have not yet tried the unique English traditional delicacies this millennium? 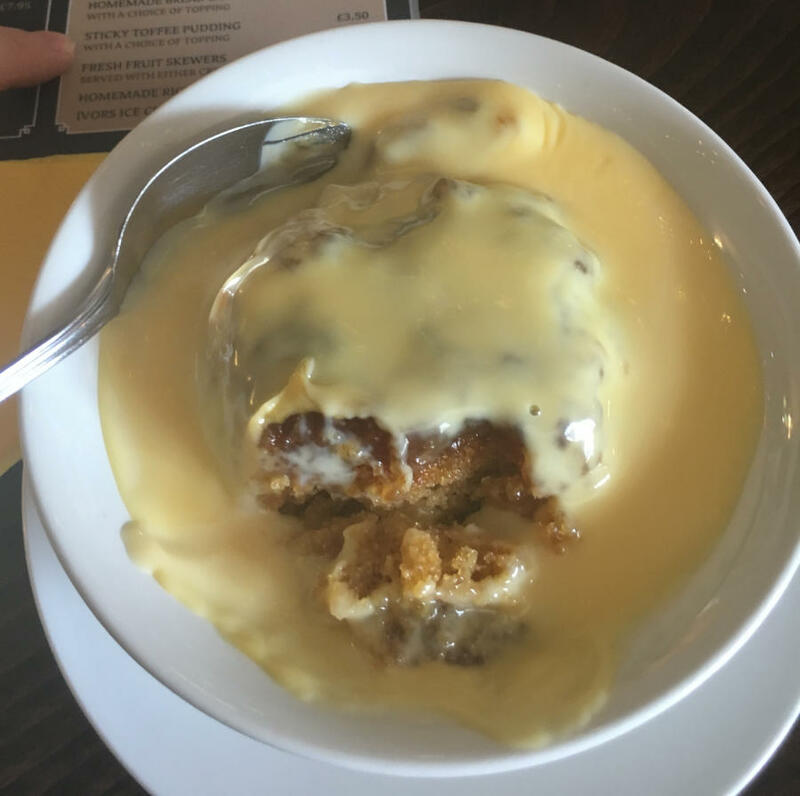 I quite enjoyed their hot Sticky Toffee Pudding with Custard. There are other toppings you may choose for your Sticky Toffee Pudding but I’d loved having British Custard on my desserts when I last lived in England and have been looking forward to having it again while here once more. Here’s some more a pictorial visit. The outside dining area as viewed from inside. It was the first part I passed from the back before entering the building. The official front desk and the side of the bar as you walk from the back entrance or back patio to the bar and dining. Oh! You might be curious as to what’s on the menu here. There are several menus providing lots of options including a 60+ smaller-portion meal (shown below) and a Curry menu for the Wednesday Curry Club option and Light Bites (shown here). 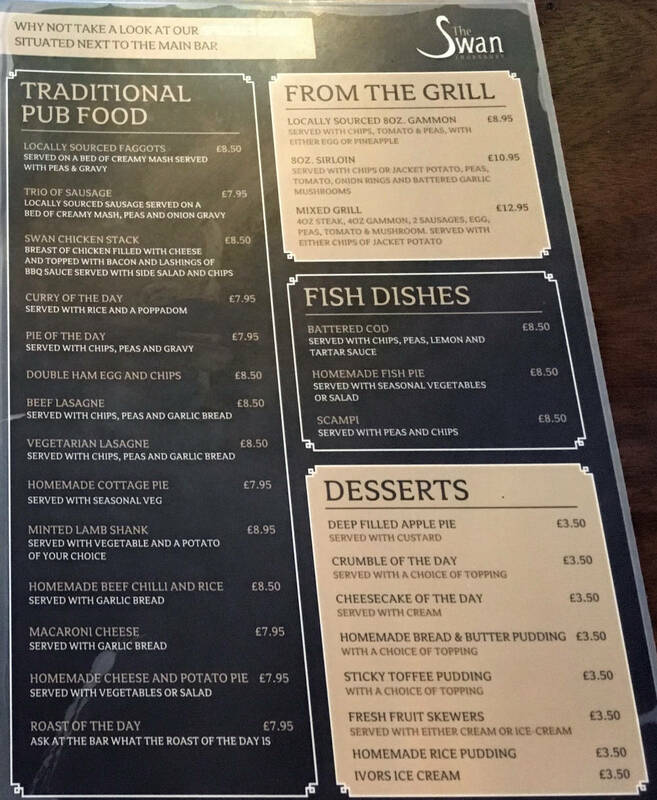 This is the British Pub Food part of the main menu. The left side of the menu lists Starters, Sides, Kids meals, and Burgers. 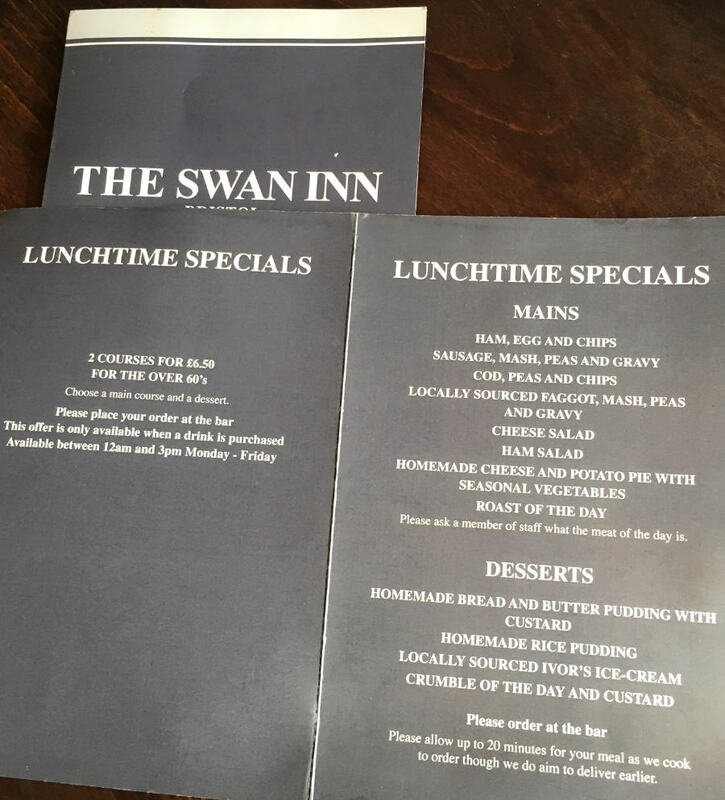 The Swan of Thornbury’s Tradional Pub food part of the main menu. 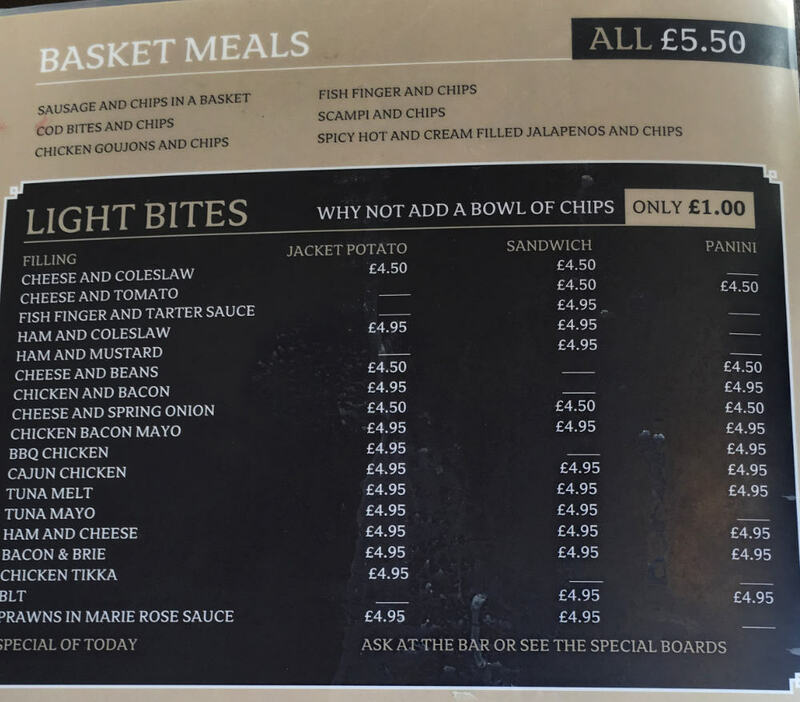 The Swan of Thornbury’s Basket Meals and Light Bites menu. 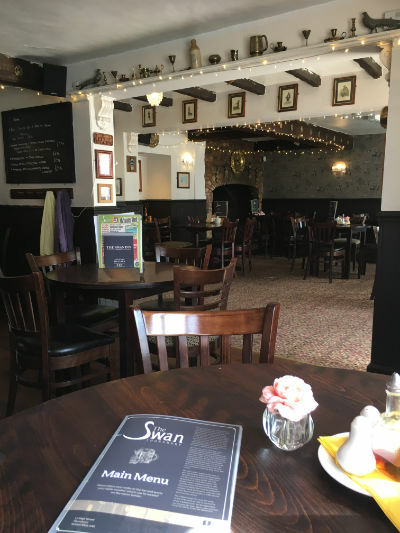 The Swan of Thornbury’s breakfast menu. By the way, you can also host special events there. PS: As with many of my pages, all photos here can be clicked on to see larger. 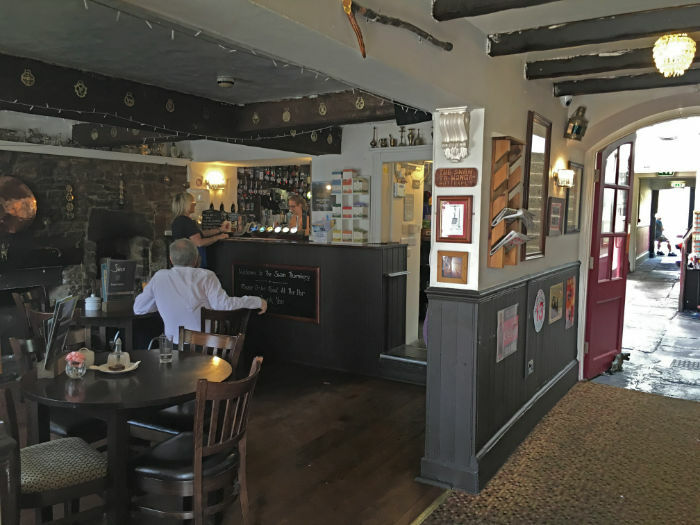 The great thing about British pubs are no two are alike. I have a daughter and a son who both want to explore England. Thanks for your post and including the menu. Great way for them to plan for a great meal! Sounds like a great experience! I can’t wait to come and try it out! I love pub food but so hard to find it here in the USA- love the pics and the description- now I want some shepherds pie with some custard on the side! Thanks so much for sharing such a special place.. Your words and pics really make it come alive! Safe travels! 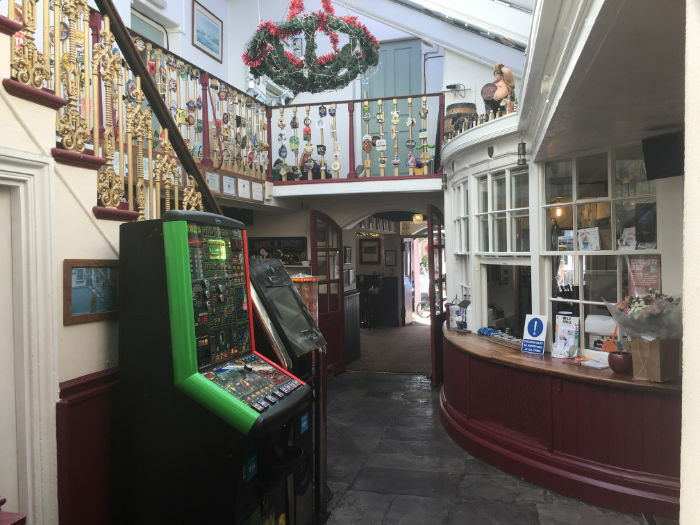 Dang–are all small town pubs so good, i wonder, or did you luckly happen upon the crown jewel? It looks quite wonderful!